This is a Ford F-250 Super Duty Cab Clear Body for the Axial SCX10 Trail Honcho. 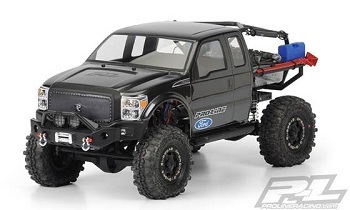 Pro-Line has a brand new body for all of the Scale Crawler fans: a Licensed Ford F-250 Super Duty Cab for the SCX10 Trail Honcho! The Honcho is a sweet looking Scale vehicle because of the built in cage in the rear and will look even tougher with F-250 Super Duty cab on the front. The Super Duty has a Bold and Iconic Ford grill that will announce to all the other trucks on the trail that you mean business! If you want to transform the look of your Honcho, this Ford Super Duty is the one to get! More colors available for Pre-Painted Flo-Tek Body for Short Course TrucksThis is a Painted and Partially Trimmed/Stickered Short Course Body. 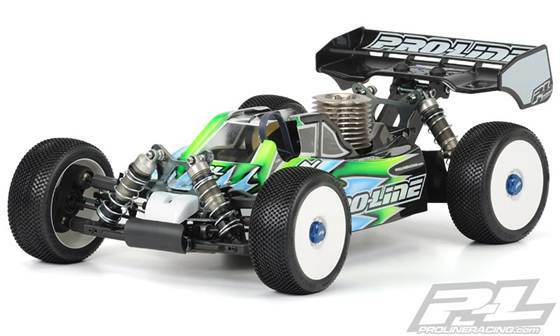 Pro-Line is pushing the limit of body development by providing a pre-Painted and Partially Trimmed/Stickered Short Course body to get you to the track faster than ever before! This is not some silk-screened China made knock-off body with blacked-out windows… This is a Pro-Line made body with clear windows that has been hand painted by the Pros! The first Pro-Line body to receive this treatment is the Flo-Tek body: Introducing the first SC body specifically designed to minimize the short-course body parachute effect! If you have ever raced or bashed a short-course truck, you know that SC bodies act like parachutes when going over jumps, causing you to lose control and crash. 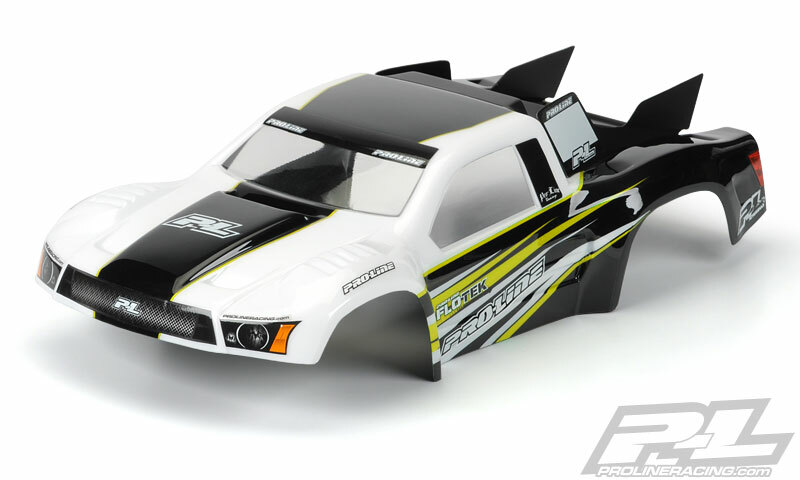 Pro-Line’s new Flo-Tek SC body features futuristic styling coupled with large vent holes that allow air to flow through eliminating aerodynamic drag. The locations and size of the vents were designed to maximize air flow through the body while keeping the aggressive and high-tech look. Don’t get caught in the wind while the competition passes you by – Get Pro-Line’s new Flo-Tek SC body today! BullDog Gen 3 Clear Body for MBX-7This is a BullDog Gen 3 Clear Body for MBX-7. Pro-Line has a new and improved BullDog design that adds enhancements that will make you go faster! The new MBX-7 Gen 3 Bulldog features a larger and higher swoop on the front side panels for more front down-force. The rear section of the roof has been angled off dramatically for a fresh new look and to allow more air to get to the cooling fins on the motor. The Gen 3 Bulldog also has a raised rear section behind the motor to increase the balance of traction front to rear for more traction on any surface. Get the most advanced body for your MBX-7: Release the BullDog Gen 3! Desert Militia Clear Body for Monster TrucksThis is a Desert Militia Clear Body for Monster Trucks. 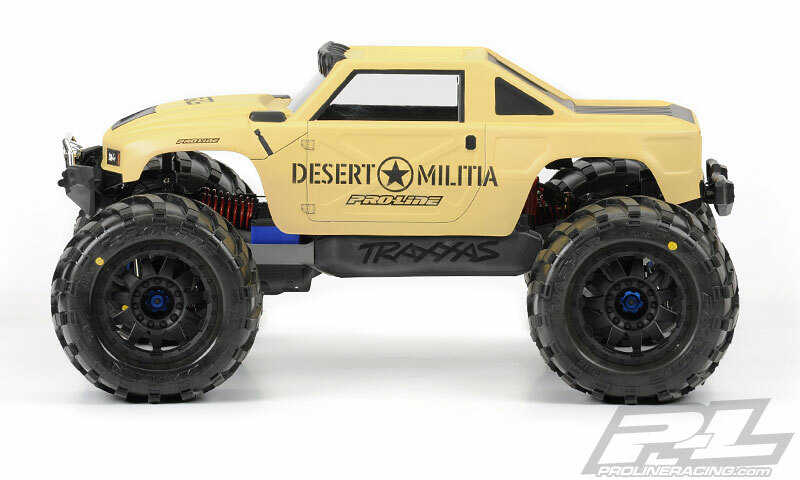 Become a desert class mercenary hunting down the competition with the Pro-Line Desert Militia body for your Monster Truck. Just imagine that you have landed a sponsor in the high tech weapons industry. Money is no object! You have chosen to build the ultimate open class race vehicle resembling a military strike fighter. The vehicles cab is an off the shelf reconnaissance vehicle, you then hang race inspired composite fenders to clear the oversized race tires and massive suspension travel. The back of your vehicle has been enclosed with aluminum quick release panels to hide the spare tires, fuel cell and oil coolers. A final touch is the full width roof mounted light bar consisting of 6 high output HID lights that are perfect for targeting the next victim. All of this has been made by Pro-Line to perfectly fit your Monster Truck. Dominate the Desert with your very own Militia body! 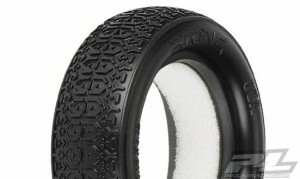 ION 2.2” 2WD Off-Road Buggy Front Tires for 1:10 BuggyThis is a pair of ION 2.2” 2WD Buggy Front Race Tires. The ION proved electrifying from the start, taking the win the First time it touched the Track! The ION was designed from the ground-up to be the ultimate front tire requiring zero break-in period and ground breaking performance! The ION fits perfectly in Pro-Line’s line-up of 2WD front tires because it provides more steering than the Scrubs and less steering than the Suburbs, giving you the option to choose the perfect tire for your current track condition! The unique molecular structure tread design provides unbelievable high-speed and low-speed steering that provides the correct balance and feel that racers are looking for. Experience the difference these top performing Pro-Line tires make for yourself – Own some ION tires today! 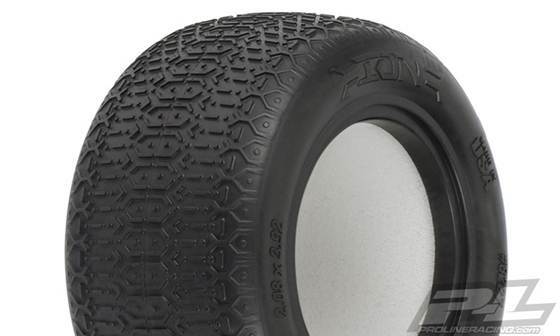 ION T 2.2″ MC (Clay) Off-Road Truck Rear Tires for 1:10 TruckThis is a pair of ION T Truck Race Tires. The ION proved electrifying from the start, taking the win the First time it touched the Track! The ION was designed from the ground-up to be the ultimate race tire requiring zero break-in period and ground breaking performance! The ION fits perfectly in Pro-Line’s line-up of Truck tires because it provides more traction and more steering than the Scrubs, giving you the option to choose the perfect tire for your current track condition! The unique molecular structure tread design provides unbelievable high-speed and low-speed steering that provides the correct balance and feel that racers are looking for. Experience the difference these top performing Pro-Line tires make for yourself – Own some ION tires today! 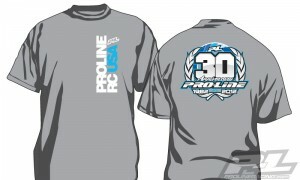 Pro-Line 30th Anniversary Gray T-Shirt for Adult S-XXLThis is a 30th Anniversary Gray T-Shirt. 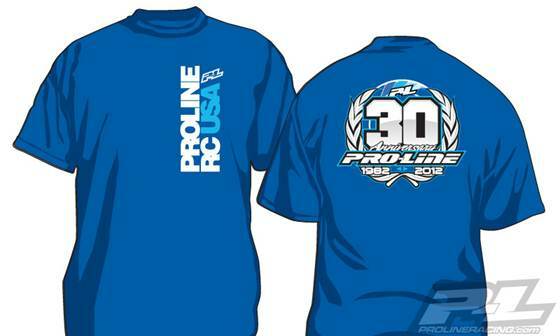 Pro-Line has a new T-Shirt commemorating our 30th Anniversary of creating Top Performing RC Products that make you go faster! This is a must have Special Edition T-Shirt for all of the Pro-Line fans around the World. Get yours today! Pro-Line 30th Anniversary Blue T-Shirt for Adult S-XXLThis is a 30th Anniversary Blue T-Shirt. 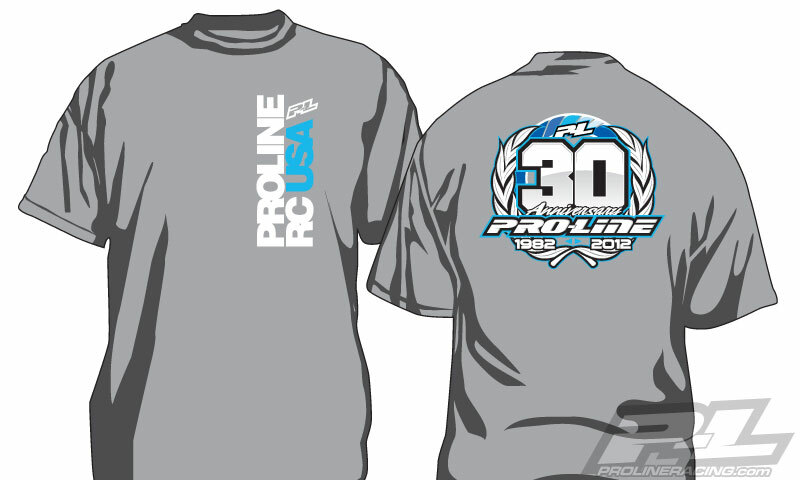 Pro-Line has a new T-Shirt commemorating our 30th Anniversary of creating Top Performing RC Products that make you go faster! This is a must have Special Edition T-Shirt for all of the Pro-Line fans around the World. Get yours today! Pro-Line Urban Blue Pull Over Hoodie for Adult S-XXLThis is a Pro-Line Blue Urban Pull-over Hoodie. Pro-Line has a new Blue Hoodie for all of you Pro-Line fans! 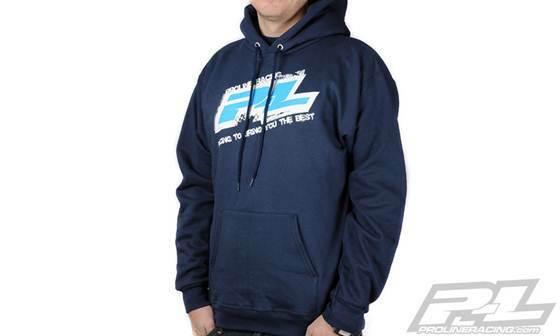 The new Hoodie has a large White and Blue P-L logo to show off your Pro-Line Pride. Get yours today!